Flying the Dragon by Natalie Dias Lorenzi. Grades 4-7. Charlesbridge, July 2012. 233 pages. Review copy provided by my local library. Skye Tsuki is super-excited to have finally made the All-Star soccer team for this coming summer, but then her parents drop a bomb on her. Her cousin Hiroshi and his family are moving to Washington D.C. from Japan and Skye's going to have to take Japanese classes so that she can talk to him. And - you guessed it - the Japanese classes conflict with her soccer games. Then, when Hiroshi starts at her school, he does such weird things and the kids in her class start thinking she's weird, too, because she speaks Japanese to him. Why can't he go back to Japan and leave her alone? Hiroshi Tsuki is completely devastated when his parents tell him that his beloved grandfather is sick - so sick that the entire family is moving to America because the Japanese doctors can't do anything else to help him. It means starting over in a completely new place with weird food and a new language. Everything Hiroshi does at his new school is wrong and his cousin, the only person he knows in the whole country, doesn't want to help him or be seen with him at school. Why can't he go back to Japan where he was happy? As the weeks progress, both Skye and Hiroshi start to get to know each other. Competitive over their grandfather's attention, Skye and Hiroshi finally begin to bond as grandfather's health declines. This is a touching realistic story about family across cultures and the immigrant experience. The story is told in alternative perspectives, so we get Skye's point of view and Hiroshi's point of view. We see what new immigrants deal with as we read Hiroshi's chapters and we learn how it feels to be caught between cultures, not Japanese enough and not American enough, as we read Skye's. Young readers will identify with these realistically-drawn characters, each a bit bratty and self-centered at times but ultimately striving to do good. The book is meticulously researched and contains lots of details about Japanese culture, both in Hiroshi's home life and what Skye is learning in her Japanese classes. Young readers will take a lot of cultural information away from this book, but it never feels didactic. The details enhance the story and will inspire curiosity about kite fighting and other Japanese cultural traditions (kanji, etc.). I felt like there was a little too much going on in the story and the first and second halves feel like two different books to me. I preferred the first half, which is more of a school story, to the second half, in which Skye and Hiroshi deal with family issues. However, that's definitely a personal preference and I can tell you that I look forward to seeing more from Natalie Dias Lorenzi. Kids looking for a contemporary story (particularly kids who enjoy exploring world cultures) will enjoy this book and it would also be useful in a classroom setting, particularly in communities with immigrant populations. I'd hand it to fans of Linda Sue Park's Project Mulberry or Grace Lin's Dumpling Days for another take on the Asian-American experience (Korean-American in Park's book, Taiwanese-American in Lin's). I'd hand it to fans of Silas House and Neela Vaswani's Same Sun Here or Katherine Applegate's Home of the Brave for another take on the immigrant experience (Indian immigrants in Vaswani's book, a Sudanese refugee in Applegate's book). Read another review by Jen, formerly at STACKED and check out Natalie Lorenzi's guest posts at the Nerdy Book Club Blog: Ten Middle Grade Books That Reflect the US Immigration Experience and Ten Young Adult Books That Reflect the US Immigration Experience. 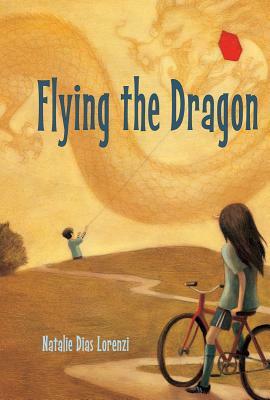 Flying the Dragon is on shelves now!